This relaxed approach to toilet etiquette more or less defines my laid-back week at Lake Temagami's Loon Lodge last week. The lodge is on an island, so to save water the rule is to only flush when there's a major development in the toilet bowl. After two weeks of 30 Days of Writing I gave myself an intervention. Yep, that's right. 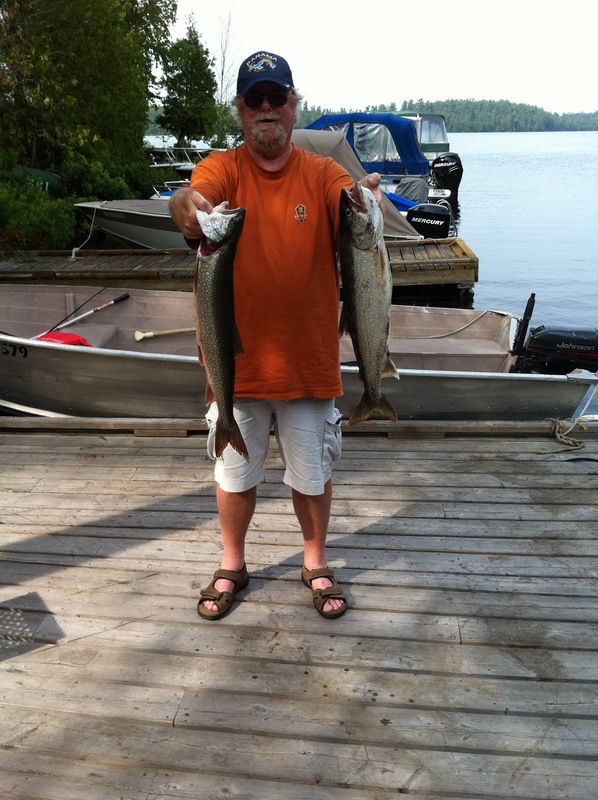 I stepped in, dashed off a third week's worth of posts, post-dated them to run each day I was away, tore myself away from my computer and a buddy and I drove 500 kilometres north to Temagami, Ontario to sit back, relax, crack open a couple of cold ones and fish. We arrived on Sunday afternoon. I'd already golfed in the morning and brunched with my kids and grandkids. Then I picked up my buddy and off we headed for a four hour drive to Temagami. After dinner we caught a species unique to the region - a couple of Corona. Monday we headed into town to do some shopping. We needed groceries. Man cannot live on beer alone - believe me, we tried. We needed food for breakfasts and lunches. Dinner was provided by the lodge. Monday afternoon we came off the lake empty handed. It wasn't for lack of trying. The lodge owner had taken us out in his boat and caught two nice sized fish. However, when I manned the net on the first catch I managed to knock the fish off the hook. My buddy was able to emulate my efforts on the second catch, which must have been over 20 pounds. It was a huge pickerel. We certainly cried in our beer over that one. The rest of the week was a lot better. 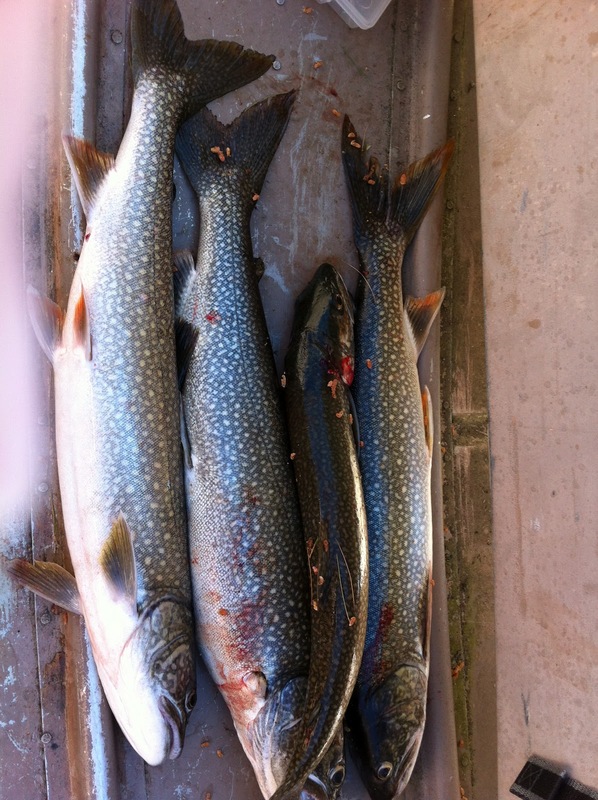 We caught oodles of lake trout. We had trout for dinner, for lunch and even for breakfast. This was a good thing. Because I thought all we'd be able to say we caught was my ball cap which blew off in the boat and which we had to retrieve using the net. Other than that, the weather was great and in our time off the water we shot the breeze, quaffed a Corona or two, complained about how much food we'd eaten at dinner, had naps, compared slogans on our t-shirts and talked about the ones that got away. All in all a great week. When I got home Sunday my wife was so excited to see me. The 2 frozen trout and half a pickerel in my cooler may have had something to do with that. Cast your line over to We Work For Cheese and check out the link thingy to check out other bloggers' interventions. Those fish were delicious.I didn't post pics of the pickerel we caught but it was equally good. Beginner's luck? I've been fishing on that lake for ten years and only this year realized I could catch plenty of fish within sight of the lodge. After two weeks you needed an intervention? Something's fishy here... So you took yourself on a week-long fishing trip, as an intervention? Easy to smoke out this tall tail - it's a whale of a bait&switch! YOU just wanted to go fishing so you're CALLING it an intervention. And you didn't even invite me. Um, ah, dammit you "caught" me. When I was 21, I went to Victoria, BC, and went salmon fishing with friends. I've never tasted better fish in my life before or after. The only thing is, in the evenings, all we did was sit around at home and drink. Is that typically Canadian? Sounds great - that's my kind of intervention. I like to fish, occasionally myself. Yeah, drinking beer's a Canadian thing. Yeah, you just did. You're losing it. Oh, it was great. Never caught so many fish. You know it's not so much the catching of the fish but more the act of fishing. It's so tranquil. Fun. Sounds delightful!!! One of the last times that my hubby caught some kind of pickerel I ended up taking him to the ER to have the hook removed from his hand! Ouch.I hope you were able to save the fish! Oh it was believe me. We had perfect weather. Caught lots of fish. And ate and drank like it was going out of style. Nice to get away for a week. Now I'm hungry. It's nice to get away. That's a really nice shot of the water and sky . . . and food. The sunsets there were spectacular. And the vista...nothing but water and sky. It's a gorgeous spot.